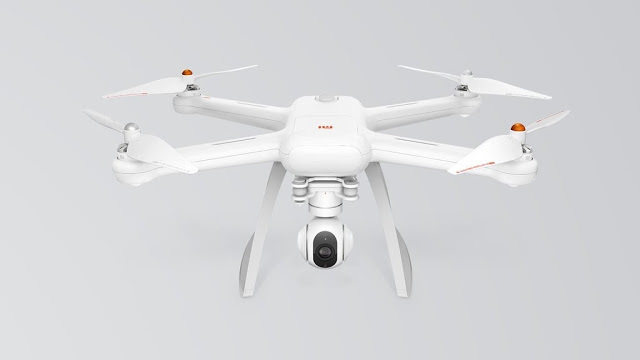 Today, Xiaomi announced that they were producing two camera-equipped quadcopters. The drones have more than a passing resemblance with the popular DJI Phantom 3 drone and share similar features, but the news generated a lot of interest because of Xiaomi’s aggressive pricing: 2499 yuan (around US$380) for the 1080p model, and 2999 yuan (around US$460) for the 4k model. Xiaomi’s drone could be of particular interest for 360 photographers because it has foldable landing gear and has a removable gimbal and camera. There are drones that have retractable landing gear such as the hot new Yuneec Typhoon H but they are not cheap (the Typhoon H is $1799 MSRP; $1299 preorder). Xiaomi didn’t say the drone has retractable landing gear – only that they are foldable. The foldable landing gear would make transport easier. However, it may also be possible to move the landing gear out of the way to get a clearer 360 shot around the drone, if the drone could be supported on an elevated platform for takeoff and [careful] landing. The other interesting feature of the Xiaomi drone is the removable gimbal and camera. With a 360-degree camera, it is not really necessary to use a gimbal, or even an onboard camera. A photographer who wants to use a 360-degree camera can therefore opt to remove the gimbal and camera to lighten the drone for greater stability and longer flight duration. Although a 360 photographer can buy a drone with no onboard camera (e.g. Phantom 2), having a removable camera makes the drone more versatile, giving the photographer the option to shoot conventional aerial photos or videos (with the onboard camera) or a 360-degree camera as needed.